Son of Napoleon's brother Lucien Bonaparte and Alexandrine de Bleschamp. He was born in England but the family returned to Italy in 1814. There he grew up. In 1832 he married Maria Anna Cecchi, the daughter of a Florentine sculptor. But the marriage was unhappy and soon the couple lived apart from each other. He mostly occupied himself with the study of languages. In 1847 his "Specimen lexici comparativi" was published and his description of the Basque language was in use for many years. In 1849 he became a member of the National Assembly in France and in 1852 he became a member of the Senate. But his interest in political matters was very limited and he moved to London soon afterwards. There he befriended William Ewart Gladstone and he dined with Queen Victoria at Windsor Castle several times. He had a son with his mistress Clémence Richard. After his wife died in 1891 he married her, but in the same year he died in Italy. 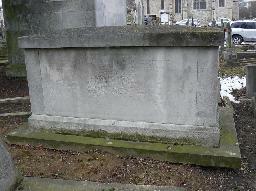 The grave of Louis-Lucien Bonaparte at St. Mary's Cemetery, Kensal Green, London.